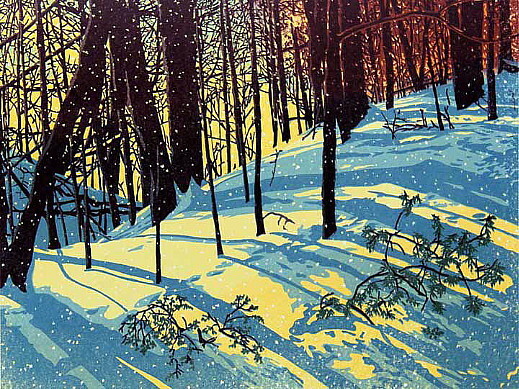 Vermont artist William Hays has been creating beautiful works of art for more than 40 years. 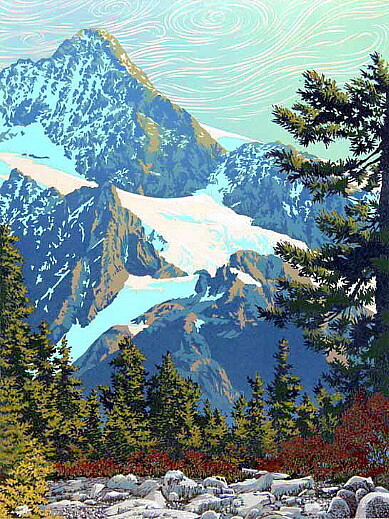 He began painting in watercolors as a teenager and eventually ended up with a degree in sculpture from the University of Alaska in Anchorage. 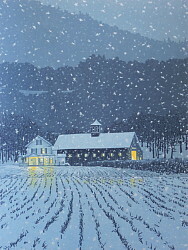 After moving to Vermont from Alaska in 1987, he concentrated on painting in oils. 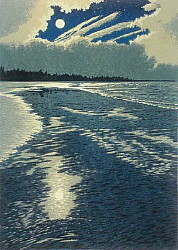 His works in linocut block prints began in 2007 with the encouragement of his late wife, Patricia. Since 2012 Hays has concentrated exclusively on block print making. Hays' work is frequently included in juried exhibitions regionally and nationally where he has been singled out for recognition. His artworks grace the walls of private collectors in more than a dozen countries around the world. 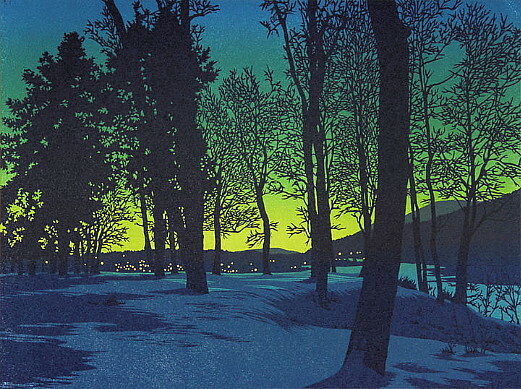 His linocut block prints are exhibited in fine art galleries in the United States and online. 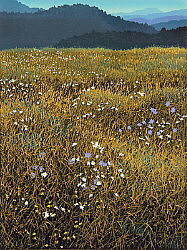 Hays says: "Landscape is the foundation of my inspiration. I often work more from memory or an impression than from a particular place. The compositions are the framework on which I hang a sequence of layered colors in rhythmic patterns to create a mood and a harmonious image. 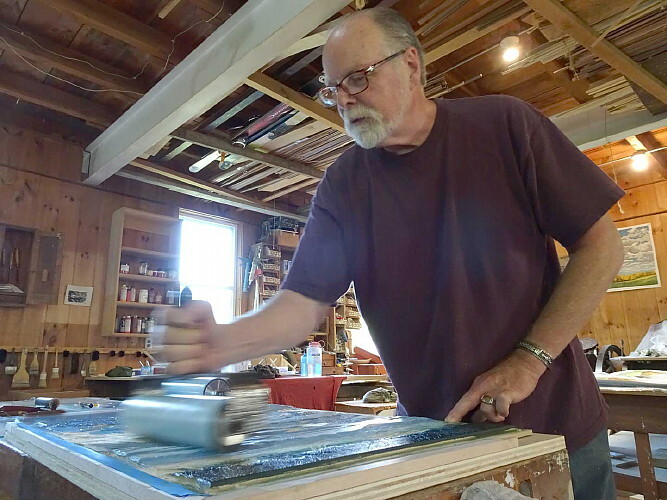 Using both reduction printing techniques and multiple blocks allows me a level of complexity that suits my drive to create artworks which evoke my imaginings, my experiences, my creations." 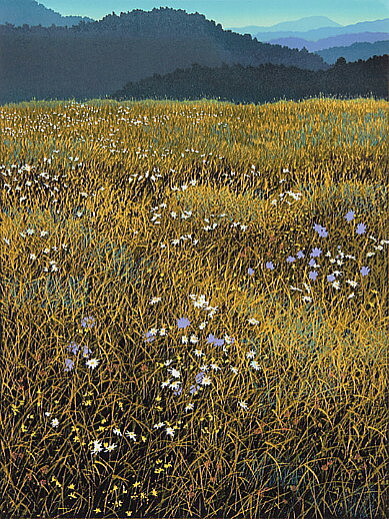 Hays linocut block prints are included in the Permanent Collections of the Boston Athenaeum, Syracuse University Art Galleries, the State of Vermont and the Vermont Supreme Court. Hays juried exhibitions list in linocut block prints preceded by his paintings in oil is quite long. 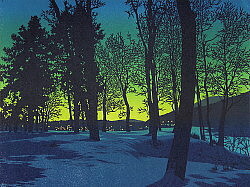 Prior to doing linocut block prints, he also did Solo Exhibitions of his oil paintings. 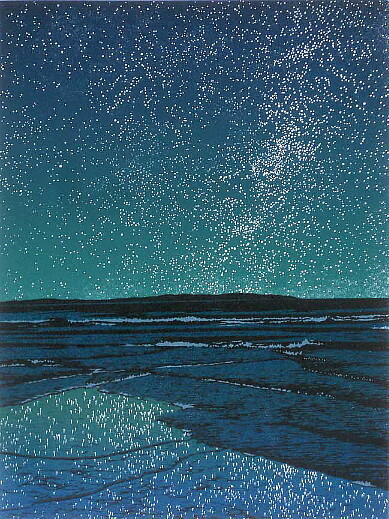 And Hays has participated in Invitational and Group Exhibitions with his linocut block prints preceded with his oil paintings. Hays also writes and has authored articles in select publications. 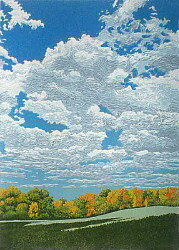 Hays work is also available at leading Art Galleries throughout New England, the East Coast including New York and Galleries in Minnesota and Michigan. 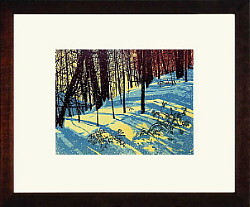 Here is our selection of Hays linocut block prints. Added prints are noted. Descriptions are in quotes since they are the comments of the artist. To order any of Hays linocut block prints shown below, please scroll down to the individual order lines below. "Ice Dawn" THIS IS THE LAST AVAILABLE PRINT OF THIS EDITION! Is a composition which looks to the dawn, winter sky through its reflection on still water. The morning glow and the morning star are filtered through the bare trees and framed by partially melted ice. 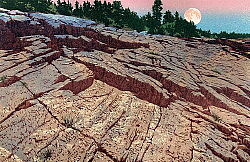 This print used two blocks and is constructed of seven separate impressions. Seven color linocut print on Stonehenge paper, 12" x 9" image size edition of 44, printed with oil-based ink. "Migration" THIS IS THE LAST AVAILABLE PRINT OF THIS EDITION! The northern mountains of Vermont and New Hampshire inspired this image. I experimented with the swirling lines of the sky and introduced the birds to my composition in order to lend motion to the image. Seven-color linocut print on Stonehenge paper, 12" x 9" image size edition of 100, printed with oil-based ink. 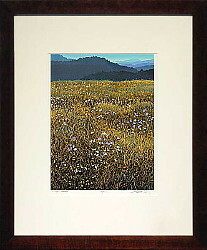 "This print addresses one of the finest landscapes in America, Acadia National Park in Maine. I've been there several times and it never disappoints. The starting point for this print is from a trip I took in 2012. It took me five years to get settled on what I wanted to do and this print is one with which I am very pleased." 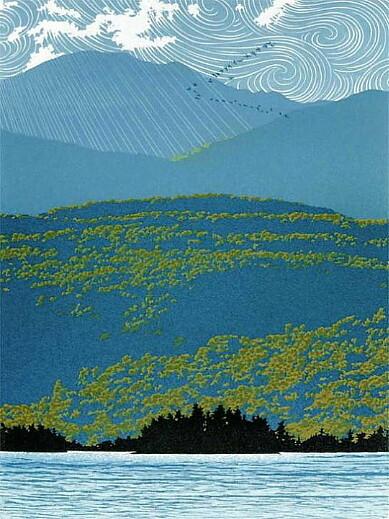 This print was honored with the 2018 Gorst Printmaking Award at the 85th Annual League of NH Craftsmen Fair. Four color linocut print with watercolor on Stonehenge paper, 17" x 11" image size, edition of 100 printed with oil-based ink. "Vermont, my home, is a beautiful place. In most parts of the state there are heavily forested mountains which roll off into the distance in diminishing shades of greens and blues. This image was borrowed from an�oil painting of the same name�which I did some eight years before this print. The painting took nearly a year of off-and-on work. The print took nearly two months of steady work. It was a complicated print to execute. Although I describe it as a 10-color print, that is really the number of impressions on press. There are many more colors than 10." Ten color linocut print on Stonehenge paper, 9" x 12" image size edition of 100, printed with oil-based ink. "Inspired by the coast of Maine and Nova Scotia, this nocturne was my attempt to capture the experience of a still, starlit night on the coast of North America." Five color linocut print on Stonehenge paper, 12" x 9" image size, edition of 100 printed with oil-based ink. "Every morning I take my dog for a long walk beside the Connecticut River in Vermont. In winter it can be quite still and lovely. 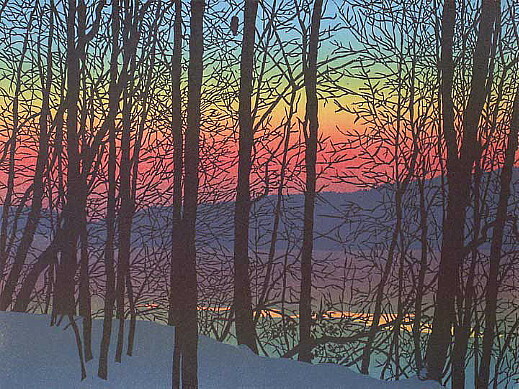 As the sun begins to rise over the mountains the sky can gradually become a beautiful spectrum of colors against which the trees are silhouetted. One morning there was an owl that took its place there and inspired this image. 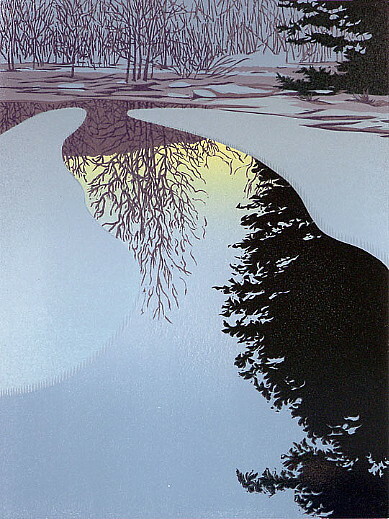 An open lead of water in the iced-over river provides a distant dash of color in the muted tones of the winter dawn. 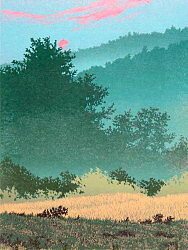 There were four separate impressions made to construct the print but the first impression alone has four colors in it." Four color linocut print on Stonehenge paper, 12" x 9" image size, edition of 44 printed with oil-based ink. "The challenge of creating clouds by means of carving is considerable. Though this print is small, it was one which took a great deal of time to create. The autumn colored landscape is borrowed from my many years living in Vermont. 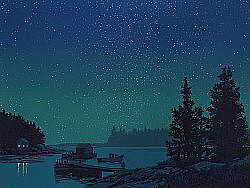 But I think my apprecation for skies such as this one comes from the many summers I spent in Nova Scotia." 10-color linocut print on Stonehenge paper, 5" x 7" image size, edition of 100�printed with oil-based ink. 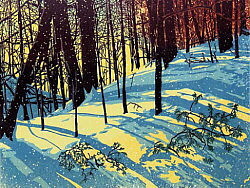 "Winter in Vermont is one of my favorite times and places to be. The snow falling in the little villages that dot the countryside is the stuff of nostalgic memories for most of America. For us, it is our home and we love the beauty of it in all seasons. 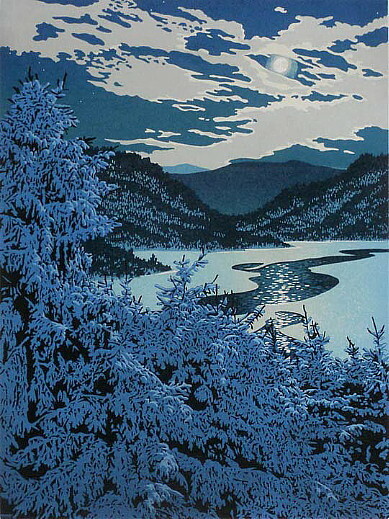 This print builds on the explorations contained within several previous night/snowing scenes I've done.7-color linocut print on Stonehenge paper, 9" x 12" image size, edition of 100�printed with oil-based ink. "Glorious Day" started with a spectacular day hiking in the Cascades of Northwest Washington State with my brother. Both of us are very familiar with spectacular mountain landscapes after many years in Alaska. But we agreed that 'it doesn't get any better than this' The mountain depicted is Mt. Shuksan, near Mt. Baker. In all, this print took a month to complete and capture as much what I felt as what I saw." Eleven color linocut print with watercolor on Stonehenge paper, 9" x 12" image size, edition of 100 printed with oil-based ink. 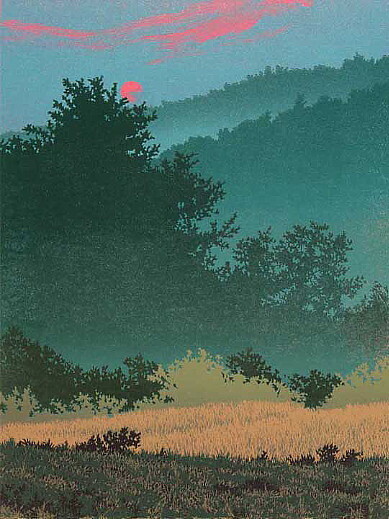 "The heavy atmosphere of a summer evening is the inspiration for this linocut print." Six color linocut print on Stonehenge paper, 9" x 12" image size, edition of 100 printed with oil-based ink. "Few things on this earth are more satisfying, peaceful and maybe even solitary as walking the beach at night with a full moon rising in the clouds. This print is inspired by my many summmers in Nova Scotia where pristine stretches of beach are still available for such an experience." 7-color linocut print on Stonehenge paper, 5" x 7" image size, edition of 100�printed with oil-based ink. "In 1998 I did a charcoal drawing which hangs in my bedroom. This drawing was the starting point for this 8-color linoleum block print. 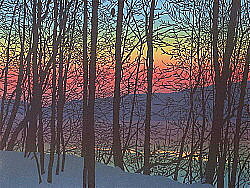 The inspiration for the imagery was the view from my home on the Connecticut River in Vermont. I can see that there are elements of my time in Alaska which contributed to the image as well. This print is a refinement of all those influences leading to this still, cold night image" This print was awarded first place in the national competition, "Ink For Alaska" in 2017 and was part of a national touring exhibit in 2017 promoting the work of the Alaska Wilderness League. 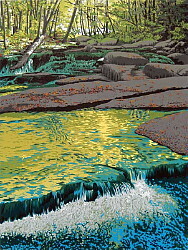 8-color linocut print on Stonehenge paper, 9" x 12" image size, edition of 100� printed with oil-based ink. "Titling my prints is sometimes difficult. Not with this one. It seemed to say it all. In October of 2014 I went up into the mountains near Stowe, Vermont and hiked around several different waterfalls over the course of a couple of days. They are wonderful things and have the same captivating quality that a campfire holds over us in the night. The sound, I can never put into my prints. But the rhythms of the falling water are a lovely challenge in the medium of relief printing." Nine color linocut print with watercolor on Stonehenge paper, 7" x 5" image size, edition of 100 printed with oil-based ink. "Since first moving to Vermont, this nearby stream has been a continuing source of inspiration for me. I've done half a dozen water colors, at least nine oil paintings and now, this linoleum block print of this special place. Each time I visit and come up on the cascades of Stickneybrook, I feel like I'm seeing it for the first time." 9-color linocut print on Stonehenge paper, 9" x 12" image size, edition of 100 printed with oil-based ink. 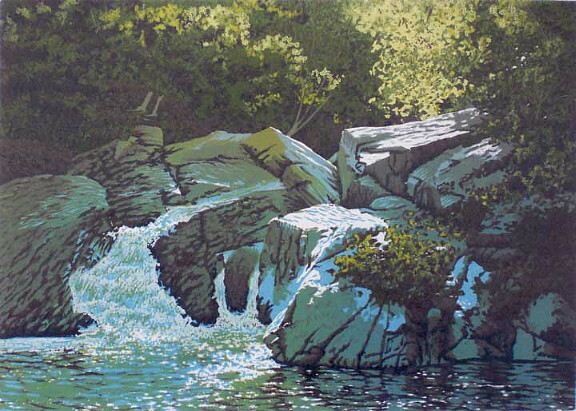 "Summer Falls" is part of a long series of images I've done in both oil paintings and linocut prints. Like everyone, I love waterfalls. 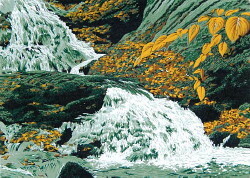 In Vermont swimming holes are frequent companions of waterfalls. 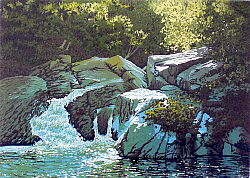 This one is on Stratton Mountain and is known as Pike's Falls. It's one of those places that if you know where it is, it's easy to find. If you don't know where it is, you'll never find it. I did pencil sketches there one day and I've been using them as the basis for images for two decades." Thirteen color linocut print on Stonehenge paper, 7" x 5" image size, edition of 100 printed with oil-based ink. The forested mountains of the eastern United States have been a part of my life at almost all times. In summer the humid air creates gauze curtains of atmosphere which partially obscure each layer of hills and forest in the distance. 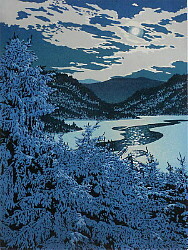 The basic idea for this image came from seeing the moonrise in the Smokey Mountains of Tennessee back in 1987 while on my way from Alaska to Vermont. 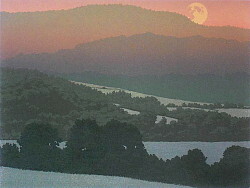 With the sunset behind the viewer, the moon and distant mountains take on the glow of the last rays of light on a warm day. This print was awarded�"Best In Show"�in the 2017�At The Walker, National Juried Exhibition�in Garnett, Kansas and was used for their promotion of the exhibition.�10-color linocut print on Stonehenge paper, 12" x 9" image size, edition of 100 printed with oil-based ink. Five color linocut print on Stonehenge paper, 12" x 9" image size, edition of 100�printed with oil-based ink.